After deciding to stay in Chinnor, Oxfordshire rather then drive to the start of the race from home, myself along with Fay and running partner Fi had to find breakfast. The only place we could find open early enough, was Tesco. 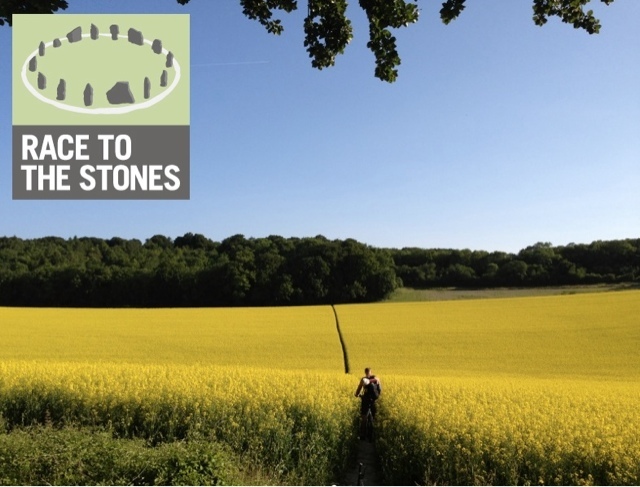 After purchasing some pastries we drove the short distance to the first running of the Race to the Stones 100km Ultra, organised by Threshold Events. 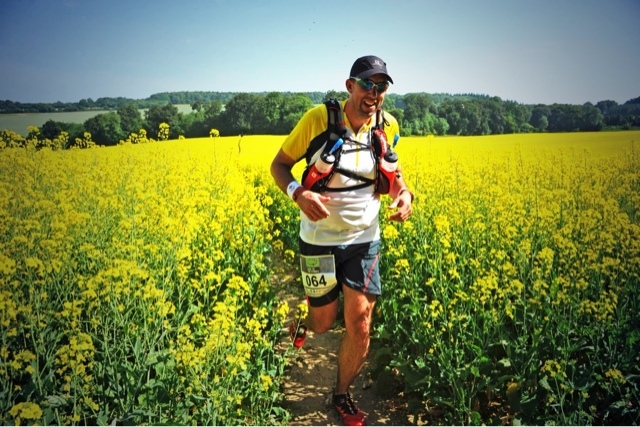 The race was organised in a way that you could enter for the non stop 100km, the two day 100km with an over night stop, one day of 50km or the other. It was also open for people to walk. I chose the non stop! The route followers the ancient Ridgeway trail. 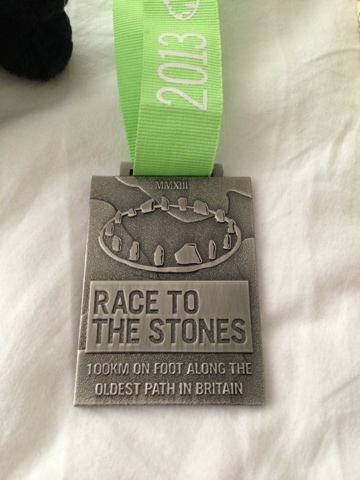 Not the full length, so the race starts from Chinnor, Oxfordshire and ends at Avebury Stones, Wiltshire. Hence the name, Race to the Stones! Clever. The week building up to the event had been glorious, weather wise. Saturday promised to be the same, if not hotter. It was already feeling warm at the start line. A last final brief from the race director and we were unleashed. Immediately we were making our way up a short hill, this is where we actually join the Ridgeway. The terrain was mainly packed hard dirt. With the occasional slowing and walking as we bunched up in narrow sections, it wasn't to long until we were spread out nicely. The weather was good and the views were enjoyable. The aid stations were set apart at roughly 10km intervals. It didn't seem to long until I was passing under the M40 motorway and heading to the first aid station. I was already becoming aware that it was rather warm out. I hadn't set off at a quick pace, more a conservative one. Just before arriving at the first aid station I emptied one of my bottles. I had 500ml of water in it, and I had drained it in 6 miles!! I was also sweating a fair bit. Thankfully I had purchased a new running vest, The Salomon S-Lab vest. I had also bought to new 750ml water bottles. One had 500ml of water, the other 500ml of Pink Lemonade Nuun electrolytes. I was glad to have them. Arriving at the first aid station we all had to wash our hands with alcohol gel. This was a first. They had flap jackets and other cakes, so it was nice to know people had clean hands. I opted to just top up my water and grabbed a few bite size caramels. Back on the trails and the course started to get a little undulating. With the temperature still rising I opted to walk the up hills. Something I was glad I did as a few of them were short and sharp. I did have a goal time in mind for this race. Something I thought possible after completing the NDW50. I became aware over this next 10km that the day was going to be about heat management. This put my preconceived time in jeopardy. Not long before the 20km aid station, you have to cross through a stunning field of Rapeseed. Maybe not good if you have hay fever, which I don't! Thankfully there was a photographer stationed the other side to get that wonderful shot as you came through the field. At the second aid station, this was the point you could pick up your packed lunch. Only being 20km I declined mine, but did pack up a packet of pop-chips. I also decided to water my cap to help cool down, but all this did was wash sweat into my eyes. I had to spend the next five minutes washing my eyes out. I set off out of CP2 munching on my pop-chips in the shade of the trees we were in. It was only a few moments later that my running friend Fi past by. She was looking good considering the heat and her Irish skin! I decided on a run walk philosophy as it was now getting to hot to run continually and I was starting to have concerns over my fluid amounts. A lot had already gone in over 20km+, and a fair bit had sweated out. I was glad to be using the Succeed caps taking one every hour at this point. I was having a good time on my own on the trails, passing many people out walking and admiring the countryside. Until I got stuck by a wasp! First time in years I had been stung by a wasp. Even after stinging me, it was hanging around and I ran off screeching like a five year old girl, until I caught up with some fellow runners, where I decided to try and play it cool. Eventually, one of the points I knew was approaching. The crossing of the A4074 Reading to Oxford road. I've ran here a few times, so it was nice to be in a familiar area. I was also aware that I was getting some hot spots on my feet, so after finding a nice place to sit down, I decided a sock change would be good and some more liberal application of Vaseline. Just after getting my shoes back on, a familiar face, well feet, went past. I'd seen those Luna sandals before. It was bib number 1 from the NDW50. I decided to catch up and have a chat. The owner of the sandals was Mark Griffiths. I introduced myself and we spent the next few k discussing our adventures on the NDW. Although we did take the opportunity to dip our feet in the Thames and cool the hot feet down. We perceived to CP3. I had seen signs for a local shop, and was looking for an I've lolly. Not being able to find the shop, I opted for a marmite sandwich and Kellogg's nutrigrain bar (strawberry). Mark had set off before me as I had opted to have a bit of a rest and look at my feet again. I decided to had some blister plasters to the front of my feet and tape up. Just as I was leaving the aid station, I got a call from Fay, my wife. She had been waiting at Streatley for me. She had seen Fi, so decided to give me a call. After our chat, she decided to walk the route to meet me. Arriving a lot quicker than I expected. We walked together into Streatley. It was now to hot for me to run. I knew if I attempted to run in that heat, I wouldn't make half way, let alone the finish. With the thought of a Calypso in my mind, we took a detour to the local shop in Streatley. Two Calypso's went into one bottle and a very nice cold can of Redbull went down my neck. Hardest part of visiting that shop was trying to leave it. The aircon was on and it was so cool. Fay and I walked together over the Thames and upto the Bull pub. This is where Fay left me, but she did say she would try to find me around the halfway point. After a good moral boost and having a cold drink and two Calypso's melting in my bottle, I picked my pace, and walked as hard and as fast as I could to catch Mark. As I came into CP4, Mark was chilling in the shade. I topped up my bottles. Including the calypso one. For some reason they were slow to melt? Unlike me! Mark and I got some grub on board, and then set off for the halfway point. It was very hot now and shade seemed to be disappearing just when we needed it the most. I thought my training upto this event had been good and that I was as prepared as I could be. I never thought about it possibly being 28c. It maybe realise the importance of warm weather training if you want to attempt races such as MDS. I had been wise enough to apply a good amount of P20 sunscreen and wear a uv protective running top. Courtesy of my running mate Michael Sartorius. I tried to go as light weight as possible to cut down on carrying unnecessary weight. I was using my new running vest, the Salomon S-Lab12 vest. It's brilliant, and no point had I felt and discomfort and had no hassles with the water bottles on the front. I'd opted for my Hilly twin skin sockets and my Salomon Sense Ultra trainers. Adidas shorts and a Salomon cap rounded off my outfit. Not forgetting my sunnies, a nice pair of shaded DeWalt workwear glasses.! Cheap but very effective! Mark and I cracked on putting the worlds to rights as I finally got to enjoy my double Calypso's. We soon came upon the first real indicator that halfway was close. Due to those doing two days or only 50km, and that the campsite/50km finish wasn't actually at the 50km checkpoint, they were being diverted along a different path. At this point on the course, everybody is exposed to the elements. We trudged on, up a hill where I got to meet the wife again. She had managed to find the route and had parked up. I was rather relieved to see her. I was now running low on water. I grabbed some from the car and quenched my first and topped up my bottle. Mark declined any. After a quick kiss and a cuddle, Mark and I set off for the last few kilometres to the halfway point. It seemed to take an age, and I was starting to suffer badly in the heat! I had finished all my water again, and every time I attempted to drink my electrolytes, I would gag. I was starting to feel like a dead weight and lethargic. I wasn't far from crawling into the half way point and I was very concerned that I may not leave it. As soon as I got into CP5 I got some water on board and filled my bottles, one with water, one with squash. The medic saw me and informed me he had a gift for me! I thought that's nice, who's it from? It turned out to be two massive soaking wet sponges that he used to cool me down!! An awesome gift! He recommended getting either some salty soup or the pasta and to drink at least a litre of fluid and to use the toilet before setting out. This is what I then did. I took my feet put of my shoes and socks and tried to get the soup and some bread on board. It was a struggle I have to admit. But after every mouthful I was feeling better. After a good half an hour spent here, Mark and I were refreshed and ready for the off. I felt like a new man! I have to thank Fay at this point. If I hadn't seen her and to get that extra water, I'm not sure I would've made halfway. Having made it that far, I'd like to thank the Medic for looking after me and all the other runners that were passing through. A true guardian angel! Thank you. Mark and I set off again. I felt like a new man and we happily had a giggle quoting Monty Python. It wasn't to long until we joined up with Adrain Smith, Andrew Perry and Courtney Maggs-Jones. We all started chatting along as a group that probably look like your normal Saturday night lads out on the town. But better dressed! Courtney struggled with our walking pace, so he would occasionally run in front of us, start to walk until we caught him and repeat the process once we did catch him. Mark and Adrain were chatting about minimal and barefoot running and I started chatting to Andrew about Ultra running. If my memory serves me right, this was Andrews first ultra! Time seemed to fly by as we rolled into CP6 at 65km looking now like some sort of camp running version of Reservoir Dogs. I opted to have a cup of coffee here and deal with my feet again. Andrew was also suffering badly with blisters which the medic looked at. I was in the process of getting blisters, so decided to replace what I had put on earlier in the day. I just wish I hadn't declined some clean socks when I saw Fay some hours ago. Silly mistake. The sun was now setting as we rolled out of CP6. Me munching on some Big D nuts! I also now had my head torch out ready to use. I had recently purchased a Hope Vision after a previous night race, where I had stumbled on anything and everything. The group was becoming a bit fragmentated and I was now feeling the effects of the coffee. Now seemed a good time to get running again. So I did. I didn't initially intend on running from the group, but that's what I ended up doing. Sorry guys, I didn't mean to be rude. Head torch now blazing and I found I had the trail to myself for a while. I past a few people on the trail and I was soon in CP7. I was feeling good. I stopped briefly here to fill my bottles and have another cup of coffee. I was expecting the guys to turn up, so I could apologise. They didn't and I cracked on. It was fully dark now and I was enjoying the solitude of running alone through some woods. But sadly the trail ended as I joined a road. I knew this was the road that would take me over the M4 motorway and that I must be close to Wroughton. It felt like the end was in sight. It was around 11.30pm. I continued running the road and crossed the motorway, but I was starting to worry. I knew we had to cross the motorway, and it felt right, but I hadn't seen a marker for a while. I decided to run for another half a mile, if no markers I'd check my GPS app. Thankfully some markers came up and I was happy. On this stretch I knew there were some hills to climb. It wasn't long until I was back on the trail and climbing a hill. I caught up with a lady who obviously liked her Moonwalks. She offered for me to over take in the narrow route through the long grass we were in, but I declined. I was pleased to have a bit of company. We continued into CP8 together. I spent a good 10 minutes here while drinking more coffee and getting some flap jack. I also decided on airing my feet for a while. As I left the aid station I was starting to feel a little cold. I stopped to put my jacket on and was met by Ben Burch and Alex Partridge. Tired now was truly set in and we walked together chatting. Alex and Ben are/were both rowers. The former being an Olympic double medalist. We discussed recovery and other things ultra running related. Again I enjoyed having some company. I was rather surprised that both of them had said that this was one of the hardest things they have done! I slowly got a head as they both stopped to water some local trees. I crossed a sty into a field and became rather paranoid that there was a Bull stalking me in the field. Not helped when I heard the two guys behind me laughing! It certainly got my legs going a bit quicker! I marched into CP9 followed by Ben and Alex. They weren't spending long in the aid stations and I grabbed a coffee and joined them for the final stretch. I grabbed some sweets and handed them out. It this point in the race I was now at the furthest point I had ever been. New PBs were being set. We soon crossed the last road and were looking forward to seeing those Stones! After what seemed an age, we still hadn't dropped of the Ridgeway. Ben and Alex were keen to setup a fund to get the Ridgeway paved. It had been tough work travelling along a heavily rutted dried out mud trail. My feet were feeling battered and I was fully aware that, despite my best efforts, I had some blistering on the underside of the front part of my feet. Off we trundled moaning away. 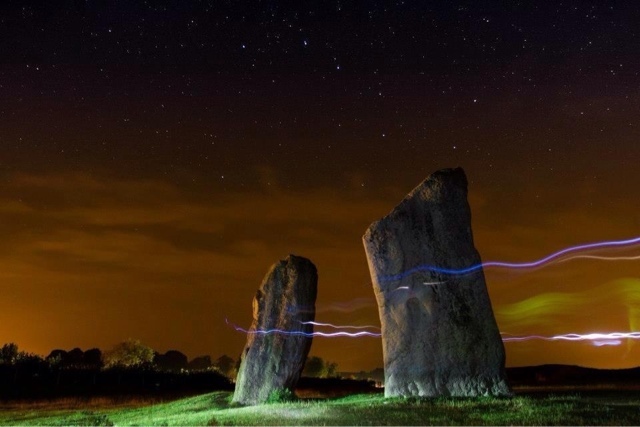 We got to the Stones, had a quick photo shoot, although I forgot to ask Ben to send it to me. We then sent off for he finish and we could start to think about recovery food! After getting back to the signage we had to cross a field to another country lane. Once on this lane we could see the finish arch. As we approached, it didn't seem to get any closer. It's like the scene in Monty Pythons Holy Grail when Kibg Arthur attacks the castle. The guards can see him coming, but never gets closer, then bam, he's there. That's how the finish line felt for me! The three of us crossed the line together. I finished the race with a double Olympic medalist!! My time was 21hrs14mins. Easily more than 5 hours more than I expected, but with conditions on the day, the finish was far more important. I set two new PBs to, 65 miles covered, my furthest distance to date and the longest time non stop. What a great feeling. Fi was there to see me finish. She had finished around an hour ahead. Maybe I could've caught her? Maybe not. For a new event, I think it was rather well organised. I knew there would be no cutoff times to worry about. This race had been opened up to give people an opportunity to compete in an ultra. The winner of the non stop 100km finished in a time of 10hrs23. I believe he was around two hours behind where he expected to be. A truly tough day out there. I had finished and knew others were behind me, some were getting ready to start day 2. I'm pleased to say that Mark, Adrain, Andrew and Courtney crossed the line together in s time of 21hrs49. Well done guys!